There are over 100 different types of electric door strike models on the market. Sevan locksmith can help you find which one is best for you and your needs. We use only high quality products from the leading manufacturers such as Von Duprin, Hes, Adams Rite, Rofu. Our expert team is fully equipped and mobile in order to service your home or business needs. Click here to see our online specials and give us a call at (206) 274-7061. 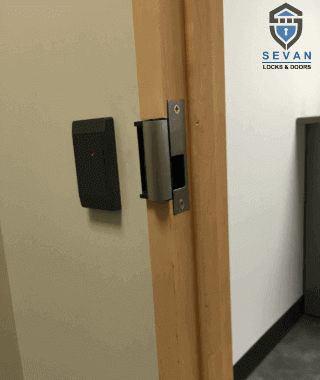 An electric door strike is an access control device that replaces the standard strike plate (where the latch from the lock goes in to) and locks or unlocks the door. But, unlike a standard strike plate, an electric strike can move out of the way upon command allowing the user to open and close the door without having to use a mechanical key. After the door is open and the person moves through the door, the electric strike will automatically re-lock given a current or having the current removed, depending on the type of strike. Like magnetic locks, electric door strikes are either fail-secure or fail-safe, meaning they either unlock during a power outage or stay locked. However, recent developments in technology is allowing the production of electric strikes to be both fail-secure and fail-safe, making them the perfect access control system for a multitude of applications. If the electric door strike uses an A/C current, you will hear a buzzing noise when the door is opened. If you’re using a D/C current, a buzzer accessory can be added if this is something you would prefer to have installed. There are many residential and commercial settings an electric door strike may be used, including pool gates, electric gates, in place of a typical latch, and more. There are four types of locks associated with electric strikes available, including dead latch, mortise, cylindrical, and rim panic exit devices. Most commonly, you can find electric strikes at the places like jails, office buildings, malls, schools or anywhere else traffic is moderate to heavy. 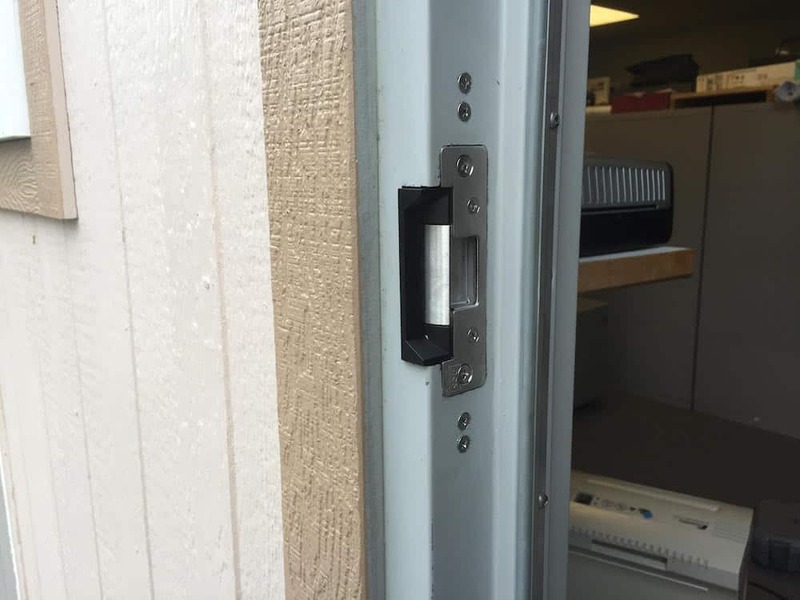 Having an electric strike allows the control of access to certain areas of a building, and can be a great addition to those looking to add a magnetic locking system. We are completely licensed, bonded and insured. We are mobile and can install electric strike the same day you call. Sevan Locksmith is open 7 days a week. We only use the highest quality tools with ever electric strike service in order to give you the quickest, most reliable service possible. We are a widely trusted locksmith company that is dedicated to always providing 20 minute response times, the most extensive warranties, and we have the lowest prices in the entire Seattle area. All services are done by our in-house, local locksmiths to ensure that your electric door strike service goes as smoothly and professionally as possible. Our friendly and professional staff is ready and willing to answer any questions you may have. We understand the need to have a locksmith company you can trust, which is why our Seattle locally owned and operated company ensures that our locksmiths are up to date on the most advanced techniques, technology and procedures to guarantee that our service is the best you will receive and will want to use again and again. Call us today for electric door strike service, to schedule an appointment, or to learn more about the electric strikes.